In this article, we will show you, How to convert the given character to lowercase using tolower built-in function and not using tolower function. This C program allows the user to enter any character and convert the character to lowercase using the built-in ctype function called tolower. 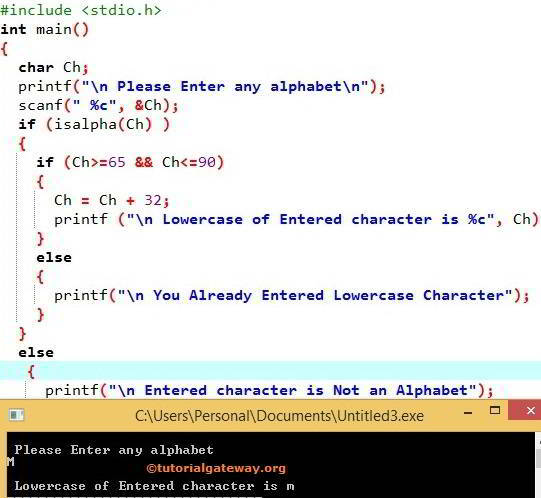 In this C Program to Convert Character to Lowercase, we declared a character variable Ch. Below printf statement will ask to enter any character you like. This C program allows the user to enter any character and convert the character to lowercase without using built-in ctype function tolower. In this example, We are going to use the ASCII code to convert an uppercase character to lowercase. Please refer ASCII Value of a Character article to understand the ASCII values of every character. As we all know that, all the uppercase characters are between A and Z and their ASCII codes are 65 to 90. So, the above if condition will check whether the given character is between A and Z. If the above condition is TRUE then we have to convert the given character to lowercase. If you observe the ASCII codes of uppercase and lowercase characters, the difference between them is 32. For instance ASCII code for a = 97 & A = 65 (Difference is 32) that’s why we adding 32 to the character ASCII value.